This is the first book I've read from J.C. Valentine and I can't wait to read more! This book is so full of feels and the push and pull of desire and resistance... it's just so yummy! Vista and Levi may be step-siblings, but even though they weren't raised together and met as adults, the stigma of being together could ruin their professional lives. Having a brief encounter when they first met, both have moved on in their own way and avoided seeing each other. Vista, who is motivated and focused on her career, came from a humble upbringing, where Levi was raised with a silver spoon and fits the cocky, confident, partying manwhore persona to a "T." After becoming injured, Levi's father decides to have Vista help rehabilitate Levi's injury as a favor to her mother, to help Vista get started after college. How will they be able to work together as a physical therapist and injured athlete? You can cut the sexual tension with a knife! And I loved their raunchy and sassy banter. Their witty exchanges had me giggling. But things get serious quickly when the air turns electric with just a simple steamy look. Will they risk their careers to be together or will they try to keep it all a secret? What happens when Levi's powerful father keeps stepping in and threatening them to say apart? What would the ramifications be if the media gets ahold of their situation? I highly recommend this story! It has everything you want in a romance! Steam, comedic relief, turmoil and angst, some more angst, character growth (and you really feel like you know them), outrage, and a few surprises! 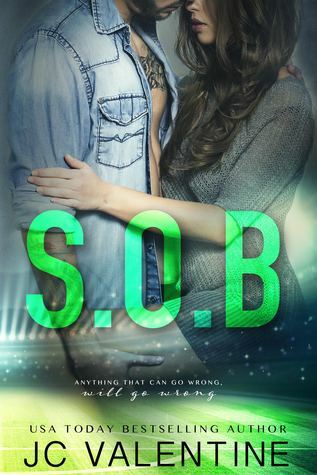 This review of S.O.B. by JC Valentine is for The Sweet Spot Sisterhood Blog. I really enjoyed this Taboo Stepbrother book! It is so naughty yet sweet, but really HOT! It also gave me a few good laughs. S.O.B. is the story of Vista Marquis, a physical therapist, and her stepbrother, Levi Black, soccer star and manwhore. They had one night of passion the night before their parents' wedding. They ended up going separate ways. However, he broke his leg on the soccer field and his dad hired Vista to get him healthy and back on the playing field. Both motivated by money, can they each keep their end of the deal? Their comedic relief to the obvious sexual tension is priceless. Levi is a character you love to hate and hate to love. He is cocky and confident. Valentine nailed it. This isn't my first book by this author and it absolutely won't be my last. I loved this book and give it 5 Stars! So, go get your one-click on because you won't want to miss how this plays out. Every now and than I love a good step-sibling romance. This one is well written. It has the hookup before becoming official sibling by marriage. And than they go their separate ways. They never expect to have to really deal with each other again. But as we all know life isn't that easy. So what will Levi and Vista do when the chemistry is too strong? Levi is definitely the male character you love to hate. Vista is the sassy character that keeps things alive. I loved that I laughed and was emotional throughout this book. The author knows how to give an equal amount of angst, steamy chemistry, humor, and down right hilarious dialogue. I loved these characters and felt like they were very realistic. There were times I wanted to yell at them and tell them what decisions to make, but you must read this book for yourself and see exactly how all the chips fall when these two have to work together. This is another great story from J.C. Valentine. Levi is a complex character that you will love and hate in equal measure, while Vista is so frustrating at times, but I liked both of them. I was annoyed with some of the decisions they made even if I kind of understood them. It's a well written book that I really enjoyed. How about son of a billionaire? Well it takes one to know one right?!? Vista is taking the job of a lifetime. One month and she will be able to as tart her own company. Just one month of living with the one man who broke her heart and tossed her out like trash. Just one month with her soccer stud stepbrother. Yeah...that should be easy. Kindness...all qualities Vista didn't realize would be her down fall. 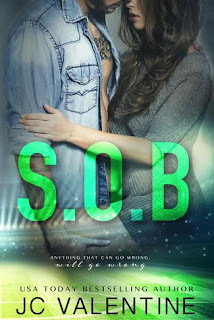 Watch her fall for the S.O.B. But watch out, Vista doesn't share!